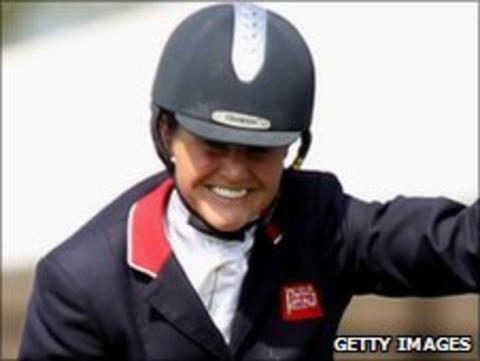 Norfolk's Piggy French has given her seal of approval to Greenwich Park's hosting of the London 2012 equestrian. Riding at Monday's first day of an Olympic test event, the 30-year-old told BBC Radio Norfolk: "It really, really is amazing. "You wonder at the beginning how it's all going to fit and work, then you see it up and running." The test is being used to help the London Organising Committee (Locog) assess logistics for the competition. French, riding DHI Topper W, topped the leaderboard with a score of 34.7 after Monday's dressage. Following her second-place finish at Badminton in April, French is almost guaranteed qualification for the London Games. "I'll be very, very excited if I'm in this sort of position next year," she said. "I think it's going to be a spectacular event, the atmosphere here is buzzing and we're still a year off. "This time next year I hope to God I've done everything I can to enable me to be here with a horse competing for my country."